High Country Crime Stoppers is seeking the public's help in two automobile related thefts. 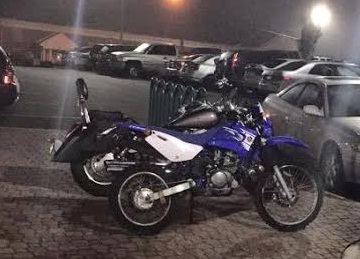 Sometime between Tuesday 03/15/2016 at 9:00 P.M. and Wednesday 03/16/2016 at 9:00 A.M. a blue and white Yamaha TTR125LW Motorcycle was taken from the front covered area of Hoey Residence Hall located on Hardin Street. Below is a picture of the motorcycle. All information will be kept confidential. You may also report crimes anonymously at http://www.police.appstate.edu/crime-tip-submission-form. Sometime between 3 PM on Sunday, March 5, 2016, and Monday, March 7, 2016, someone removed six 50 inch LED light bars from a white Jeep Wrangler, parked in the parking lot of High Country 4X4, located at 465 East King Street. The light bars are 50 inches in length and have a dual row of lights. Two of the light bars are unique, in that they have both a top row of white and a bottom row of yellow.